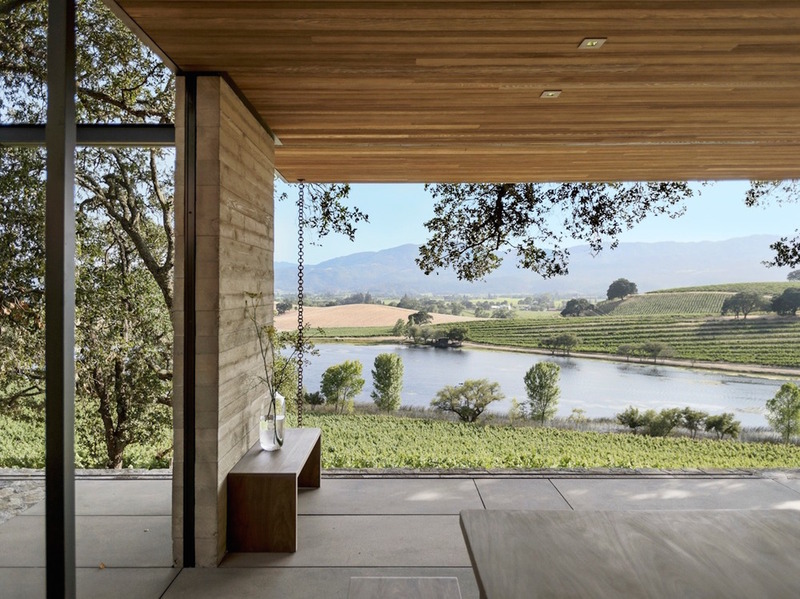 There are few places better to enjoy fantastic wines and views than Napa Valley, and Walker Warner Architects has elevated that experience with a series of elegant wine tasting pavilions. Crafted with environmental sustainability in mind, the pavilions were built for Quintessa Estate Winery, a Napa Valley estate also designed by Walker Warner Architects in 2003. The minimalist structures harmonize with nature with locally sourced and reclaimed materials, as well as prefabricated construction to minimize site impact. Winner of a recent American Institute of Architects San Francisco (AIA SF) Citation Award, the Quintessa Pavilions is commended for exemplifying “the ideal fusion of architecture and nature” on the ridgeline of a beautiful 280-acre winery estate. 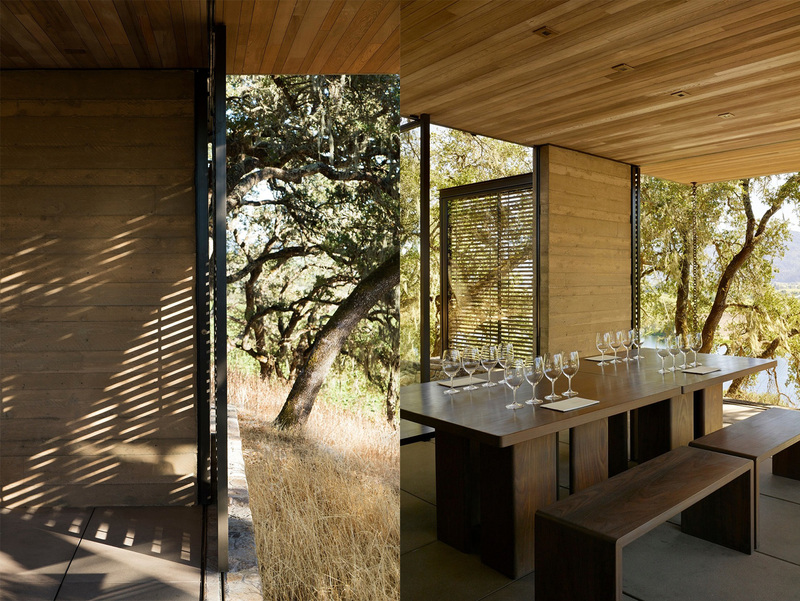 Carefully placed amongst existing oak trees and surrounded by drought-resistant native grasses, each 250-square-foot pavilion was crafted to provide an immersive, privately hosted wine-tasting experience. The pavilions’ industrial materials palette references the winery’s architecture and will age elegantly over time. The architects carefully sited each pavilion to shade visitors beneath tree canopies, optimize views, and protect existing mature oaks. Visitors access the pavilion through a doorway carved into a concrete wall, built of fly ash, that runs along the ridgeline. Once inside the prefabricated steel structure, the visitors enjoy plenty of natural light, cross winds, and panoramic views through full-height glazed operable doors. Custom furnishings are built of FSC-certified Afromosia. 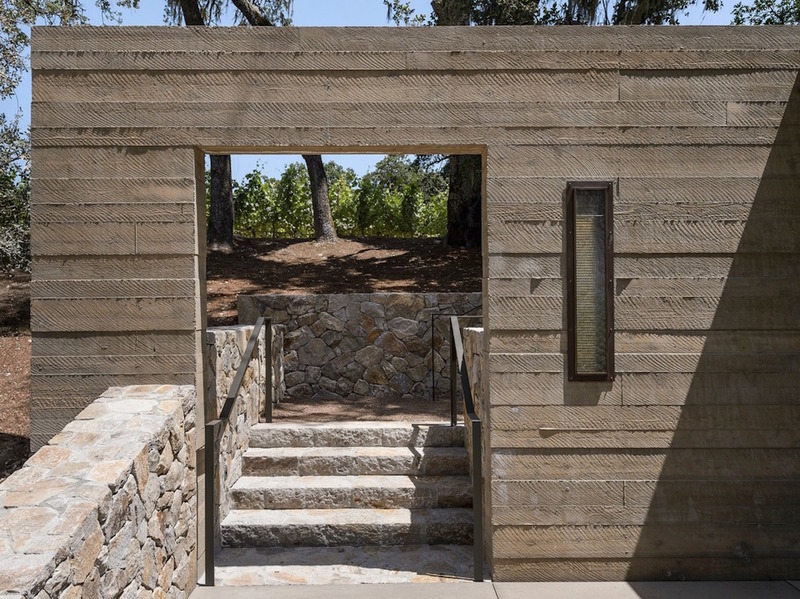 Reclaimed Sinker cypress was used for casework and ceilings, while locally prefabricated concrete pavers cover the terrace surface and Napa syar stone retaining walls hold back earth. Winner of a recent American Institute of Architects San Francisco (AIA SF) Citation Award, the Quintessa Pavilions is commended for exemplifying “the ideal fusion of architecture and nature” on the ridgeline of a beautiful 280-acre winery estate. 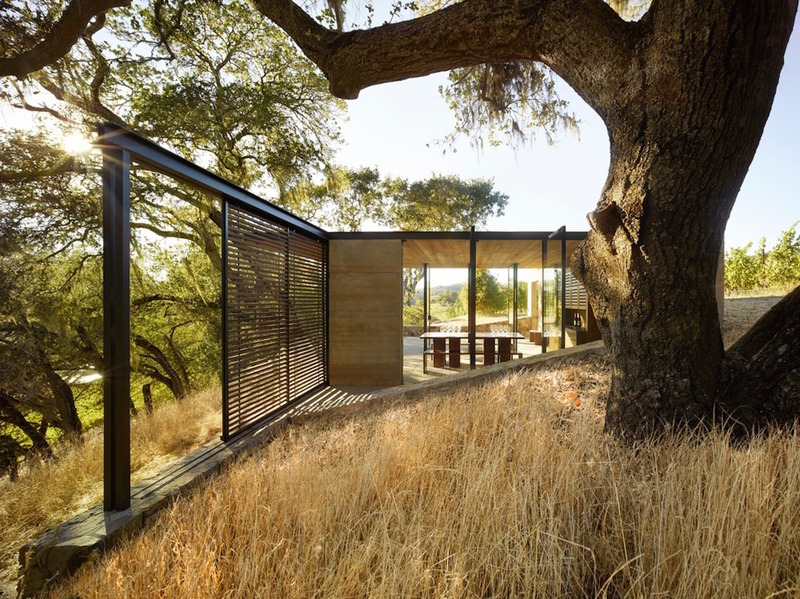 Carefully placed amongst existing oak trees and surrounded by drought-resistant native grasses, each 250-square-foot pavilion was crafted to provide an immersive, privately hosted wine-tasting experience. The pavilions’ industrial materials palette references the winery’s architecture and will age elegantly over time. The architects carefully sited each pavilion to shade visitors beneath tree canopies, optimize views, and protect existing mature oaks. Once inside the prefabricated steel structure, the visitors enjoy plenty of natural light, cross winds, and panoramic views through full-height glazed operable doors. 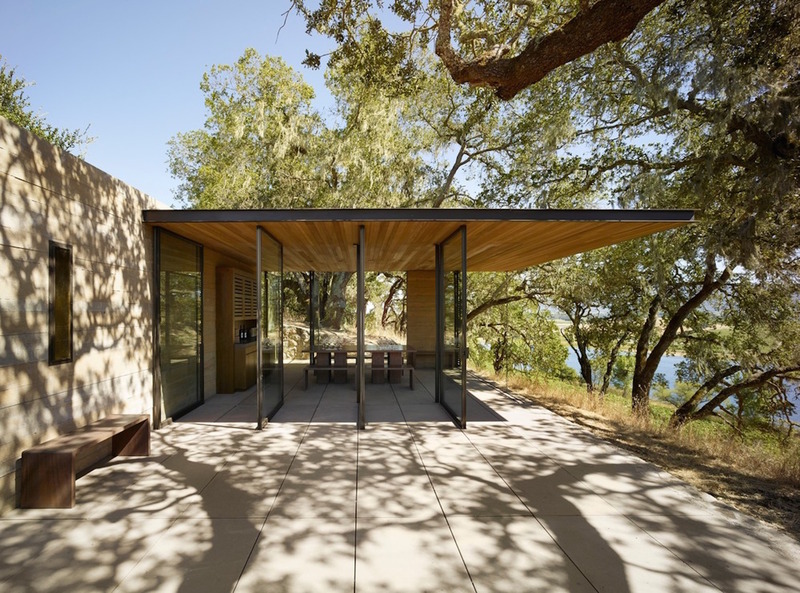 Reclaimed Sinker cypress was used for casework and ceilings, while locally prefabricated concrete pavers cover the terrace surface and Napa syar stone retaining walls hold back earth. Visitors access the pavilion through a doorway carved into a concrete wall, built of fly ash, that runs along the ridgeline.